A indexable counterbore is a cylindrical flat-bottomed hole that enlarges another coaxial hole, or the tool used to create that feature. A counterbore hole is typically used when a fastener, such as a socket head cap screw, is required to sit flush with or below the level of a workpiece's surface. 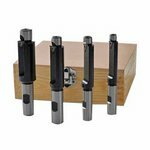 Porting tools are designed to enlarge a pre-drilled hole and easily produce a complex form. 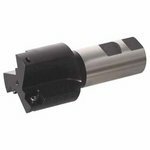 Porting tools can be used for both lathe and mill applications.